Promoting the content is an important segment of blogging, but bringing your content in-front the audience who loves it is a difficult task, your content will get more Facebook shares, likes and retweets only if it gets the right audience. So how to get the audience who love your content? How to increase social media shares and traffic? In this article, we have introduced the free platform to increase your social media shares and traffic i.e. Viral Content Bee. What Is Viral Content Bee & How It Helps to Increase Social Media Shares and Traffic? Viral Content Bee which was formerly known as Viral Content Buzz is a free platform that helps to bring more social media shares to your content in a trusted way. Viral Content Bee only accepts quality content, so if you want more social shares then be sure to submit quality content with catchy title. How Does Viral Content Bee Works? Viral Content Bee platform works on mutual sharing concept, you will get the credits when you share others articles, you can use these credits to promote your own articles on this platform. The social shares you get for your content in Viral Content Bee are shared or retweeted by someone who are interested in your topic but not the fake ones. How to Effectively Use Viral Content Bee to Get More Social Shares? 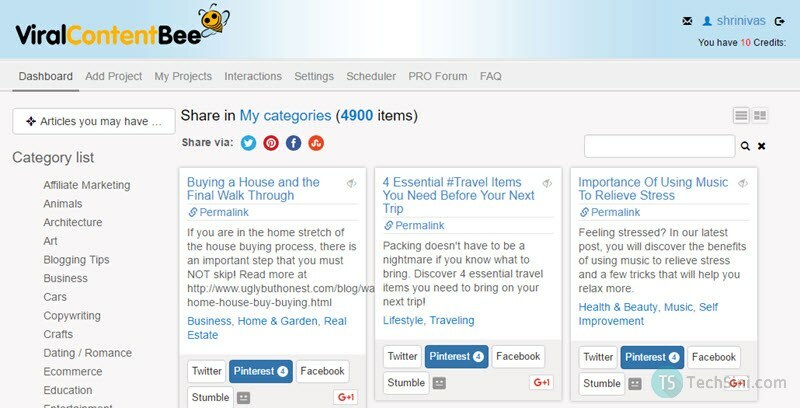 You can start submitting your content for social share once you sign up for Viral Content Bee. Once you signed up, you have to connect your social accounts in Viral Content Bee to share or retweet other articles. You can connect Twitter, Facebook, Google Plus, Pinterest and Stumble networks. Initially you will get some credits to submit your content, you will receive credits when you share others articles which you find interesting. In your profile page you can choose the categories which you are interested in so that you can share or retweet your favorite topics only. How Do I Submit My Content on Viral Content Bee? 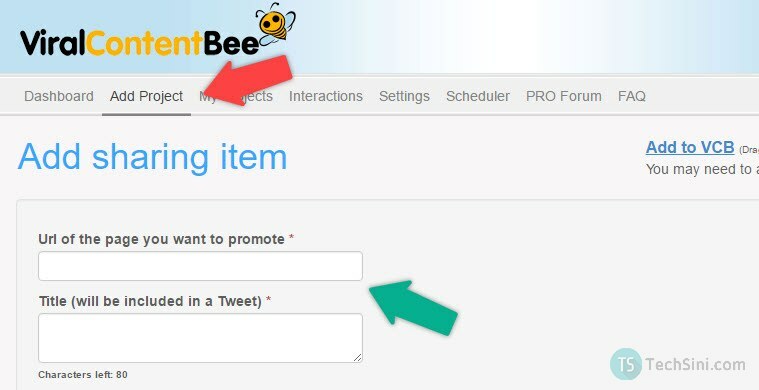 Click on “Add Project” to add your article to Viral Content Bee, you can start submitting your content once you have a handful of credits. But be sure to submit quality content as Viral Content Bee checks every article and it rejects the content if your article doesn’t comply with their guidelines. Using a catchy title and creating the content with 300+ words is all you need to get approved in Viral Content Bee. You can spice up your content by adding relative images and videos. All it takes is around 20 minutes of time in a day to work with Viral Content Bee, ten minutes to share others content and another ten minutes to submit your content. If you do it properly, you will surely get more social shares and traffic. Does Viral Content Bee Comply with Google AdSense? Yes, Viral Content Bee doesn’t violate Google Adsense terms so it is safe to use Viral Content Bee. Thanks for the blog. One of the best way to Use Viral Content Buzz. It’s one of my favorite places to promote my social media channel thanks for the info.